Learn some interesting information about Chile while enjoying a range of fun facts and trivia that's perfect for kids! Read about the population of Chile, the capital city, popular sports, unique geographical features, indigenous people and much more. The official name of Chile is the Republic of Chile. Chile is the longest north-south trending country in the world at over 4,600 km in length, however on average it is just 150 km wide from west to east. 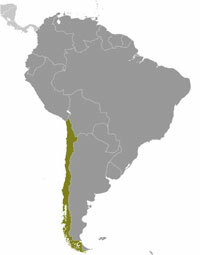 The main indigenous people of southern and central Chile are called the Mapuche. Today just 5% of the population is Mapuche or other native people. The official language of Chile is Spanish. Chile is home to some 17 million people (17,216,945) as of July 2013. The capital city of Chile is Santiago which has a population of around 7 million people, about 36% of the total population. Easter Island is a Polynesian island and Chilean territory. It is the world's most isolated island, located 2,300 miles (3,700 km's) west of Chile. Easter Island is famous for its 887 'moai', giant figures carved in volcanic stone. Found in the north of Chile, the Atacama Desert is the driest place on Earth, with an average rainfall of less than 0.05 mm a year. The crater lake of Ojos del Salado in the Andes on the Chile-Argentina border is the world's highest lake at 6390 m (20,960 ft). The Ojos del Salado volcano itself is the highest historically active volcano on Earth at 6,893 m (22,615 ft). Chileans call their country: país de poetas (country of poets), for good reason too, the country's two Nobel Prize winners both won in Literature. Gabriela Mistral in 1945, and the country's most famous poet, Pablo Neruda in 1971. Chile is one of the most stable and prosperous nations in South America. The currency in Chile is the Chilean peso. Tennis is Chile's most successful sport, however, football (soccer) is Chile's most popular sport, the country has played in the World Cup 8 times including hosting the 1962 event. The national sport of Chile is Rodeo which is still very popular in rural areas of the country. The Chilean War of Independence was fought against the Spanish between 1810-1826. Chile celebrates its National Day (Fiestas Patrias) on the 18th and more on the 19th of September each year in memory of its independence. Since 1967, it has been compulsory to hang the Chilean flag from every public building in the country during Fiestas Patrias. The flag must be in perfect condition, hung correctly from a white pole or from the building front. Failure to do so can result in fines of up to 40,000 pesos (about US$ 80). For more information, check out maps of Chile or take a closer look at the Chilean flag.